But after a preliminary investigation of the Jan. 6 attack at the Fakhura girl's elementary school, "we're 99.9% sure that no militants were at the school," says Chris Gunness, a spokesman for the United Nations Relief and Works Agency (UNRWA). The agency questioned survivors, including UNRWA staff that run the school under U.N. auspices. Before Israeli bombs fell outside the school, some 400 Palestinians fleeing shelling of the Jabalya refugee camp had taken shelter inside Fakhura, hoping that the U.N. flag would shield them from harm, according to survivors. Earlier, the U.N., which oversees relief efforts for more than 800,000 Palestinians in Gaza, had passed along the coordinates of all its schools and buildings to the Israeli military so that its humanitarian missions would be spared attack. Some reports say that Israel struck with artillery shells, while others say with mortars. Thirty Palestinians were killed outright from the incoming fire, and 10 others died last night in Gaza's overburdened and badly provisioned hospitals, according to the U.N. More than 55 were injured. Israeli bombs also hit a second school on Tuesday, say Gaza residents, killing three civilians. Some Jabalya refugees at the school said they saw a small group of militants firing mortars near the school and running away, the Associated Press reported. 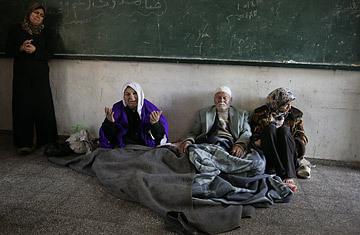 A Gaza resident contacted by TIME said there is a citrus grove not far from the school. "Most likely, the militants fired from there," said the resident, who requested anonymity. The school deaths intensified urgent international calls for a cease-fire. Israeli diplomats said Israel was taking "very, very seriously" a cease-fire proposal from Egypt and France that is backed by the U.S. Several senior Hamas officials in Cairo were briefed on the proposal and said they were debating it. The Egyptians are suggesting that both sides agree to an immediate truce, then work out long-term details on lifting the Israeli blockade of Gaza. However, one member of the Hamas politburo in Damascus complained to TIME that the proposal does not call for the immediate withdrawal of Israeli troops from Gaza. "Without that, it's a joke," he said. On Tuesday, as the Israeli military tightened its hold on Gaza's towns and refugee camps, civilian casualties mounted sharply, with 77 killed, taking the total death toll to 631 since the operation began 12 days ago. Israel says it will not halt its ground offensive until Hamas stops firing rockets into Israel. Hamas launched 30 rockets on Tuesday, striking towns near Gaza but causing no casualties. Meanwhile, Israeli Prime Minister Ehud Olmert said he would allow the opening of a "humanitarian corridor" to bring supplies to the besieged 1.5 million Gazans trapped by the conflict and called for all fighting to be suspended for three hours on a daily basis to allow residents to stock up on necessities. "While we welcome the humanitarian corridor," says Gunness, the UNRWA spokesman, "this cannot compromise the need for an immediate cease-fire." The original version of this story said the the United Nations Relief and Works Agency school in Jabalya was hit by Israeli bombs. That was based on a preliminary UN report on the Jan. 6 incident that referred to "the shelling of the UNRWA school." That report was later clarified to indicate that the shelling and the fatalities took place outside the school. The report reiterated that many among the more than 40 fatalities were among the 1,368 people who had taken refuge in the school. Read about the battle in Gaza.